This page is a translated version of the page Astoria and the translation is 100% complete. Astoria was founded in 1921 in Hamburg by Georg Ilgner, which until then had been the Montblanc director of the production. These, with the financial support of Herman Dietzel, Sigmund Popper and Wilhelm Frings left Montblanc to start his own business. Astoria began producing very good quality safety pens, very similar to those of Montblanc. Even the company logo, consisting of a circle divided into four segments of alternating black and white color likes a lot, if only for the contrast of black and white color, the one of the company Ilgner came. In addition to the safety models Astoria also produced lever filler pens with and a good number of good quality overlay pens, coated in gold and silver. 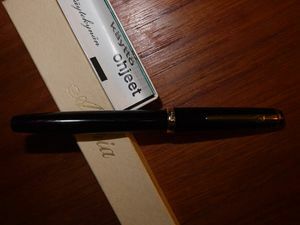 The company suffered a financial crisis in the early 30s, and in 1932 was reacquired by the Montblanc that maintained the production of pens with this brand until 1936, at least as regards the main production facility in Germany. Astoria pens produced in this period appear to be of the best quality, so they are very often treated the same way as Montblanc, which erroneously (at least for models earlier than 1932) is considered a sub-brand. Having been active in the market for a few years, the Astoria are quite rare and therefore have a considerable value to collectors. 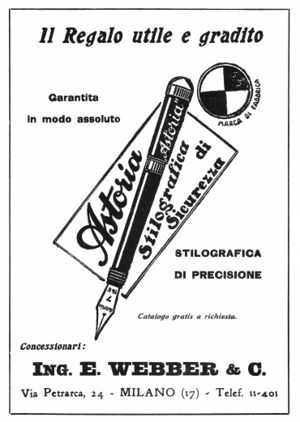 Despite the dismission of the brand in 1936 reported by many people, there are still signs of a continuation of the Astoria production also in a subsequent period, as it can be seen from the picture shown next, showing a pen with the typical 60s design of an hooded nib. In the specific case that's a pen marked Astoria found in Finland and with a Montblanc instruction booklet for the 60s models. It is not clear whether in this case the use of the Astoria brand has been used for a generic production of a second tier economic pens as a Montblanc sub-brand, or rather it is an original production but addressed to some selected foreign markets (in the case of Northern Europe). ↑ as reported in this thread on FPN, and from the subsequent conversation with the actual owner, this is a pen remained in the family since its purchase by the his father. This page was last edited on 5 January 2019, at 02:39.